Lisa Shearin - the National Bestselling Author of the fantasy adventure series featuring Raine Benares, a sorceress and seeker of things lost and people missing. 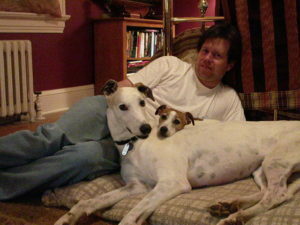 For those of you who have been fans for a while, you know that my husband Derek and I adopt retired racing greyhounds. We love greyhounds, and can’t imagine our lives without them. Florida recently passed Amendment 13, which will end greyhound racing in Florida by 2020. Even before this, the downturn in the economy had forced racetracks in Florida and elsewhere to cut back races, and some tracks are closing altogether. 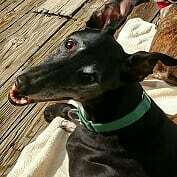 That was how we got our sweet boy Andy; the track he was at in Melbourne, Florida, was closing and the racers were being put up for adoption. 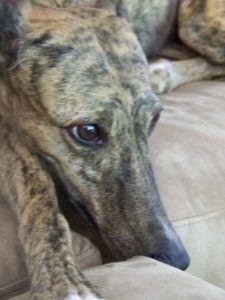 If you are looking to bring a dog into your life, please consider a greyhound. Contrary to popular belief, they don’t require a lot of exercise. They’re trained as sprinters, not runners. 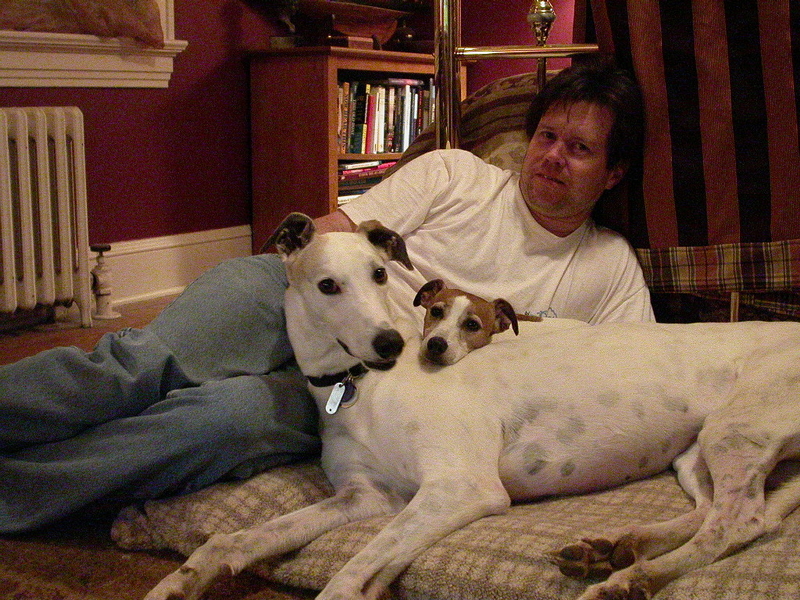 In fact, greyhounds are called “45-mph Couch Potatoes.” There’s nothing they love more than a good snuggle. 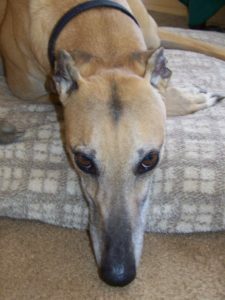 Adopt a Greyhound.org is a great site for pretty much any question you could possibly have, and for anything you could want to know about adopting retired racing greyhounds. 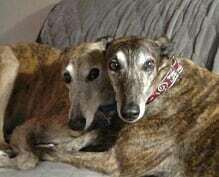 Plus they have a page where you can find a greyhound adoption group anywhere in the world. 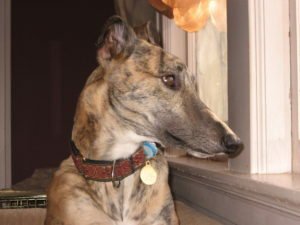 Wherever you are, there’s probably a greyhound adoption group nearby. If you’re interested in greyhound adoption, contact a group near you. Most have Meet & Greets where you can meet and pet the hounds (just be prepared to fall in love). And when you’ve decided that you home just isn’t complete without the pitter-patter of retired racer paws, contact one of your local greyhound kennels to arrange a visit. 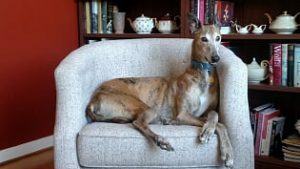 There are many books if you’re interested in finding out more: Adopting the Retired Racing Greyhound by Cynthia Branigan is considered THE must-read for prospective adopters. And I don’t know what I’d have done without my copy of Retired Racing Greyhounds for Dummies. 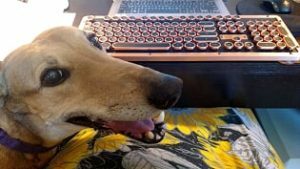 My author friend Stacey Kade has greyhounds, as does an author whom I think you’re all familiar with — JK Rowling. The Leaky Cauldron has the great adoption story. And here are some photos that she sent to the Greyhound Rescue Fife (in Scotland) of Sapphire (her beautiful blue girl) in her new home. Click on their “Harry Potter Page.” In the second photo, Sapphire is in the small bed because Jo’s Jack Russell Terrier thought the big bed was for her. Cammie (Racing name: “Mac’s Dr. Cameron”) helping me write. Dory (Racing name: “JD’s Belligerent”) snuggling with big brother Odin.